Whoa: 16-in, 12-out, 24-bit 96KHz audio plus MIDI over FireWire for PC and Mac, US$599? At least on paper, Hercules' new interface, due to ship in December, is impressive to say the least. The new interface also features 2 mic/instrument pre-amps, no latency monitoring, and OS X drivers, plus bundled copies of special editions of Storm and Live. If the hardware name is familiar, Hercules is best known as the major "high-resolution" graphics board for the PC in 1982 -- anyone remember selecting Hercules drivers on your IBM XT? This is the company's first entry into the Mac audio market; it'll be interesting to see what the reception is to the new interface. At that price, people are likely to at least look -- and from the screenshot, the interface looks quite portable, too! Press release with full specs Post a comment ? USB Virtual Instruments' Plugsound plug-ins, including Plugsound Free, are now in beta on OS X at version 1.87, the first OS X release of this previously OS 9 and Windows-only sample playback synth. 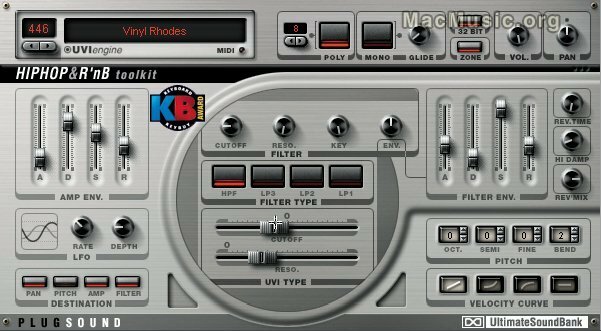 MAS, VST, RTAS, and AU are supported on OS X. The software is a Keyboard Key Buy recipient so quite welcome on OS X (and the only software I've seen to advertise the Keyboard award in the interface!). Plugsound download Post a comment ? 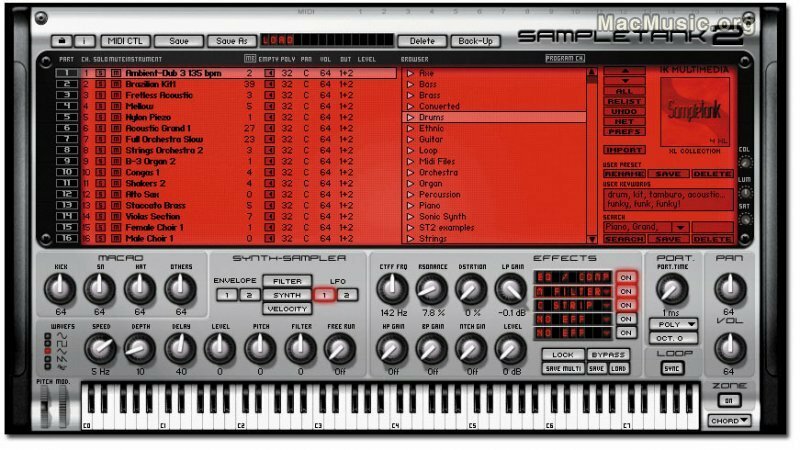 IK Multimedia says it has started shipping pre-orders for SampleTank 2 this week, its highly anticipated sample playback workstation for RTAS, VST (OS 9, X), MAS (OS 9) and AU (OS X) as well as Windows RTAS, VST, DXi. Upgrades are available for SampleTank 1 users starting at USD/EUR 249. With 8 CDs, SampleTank is shipping with some 4.5GB of samples and the technology was even featured in the Matrix Videogame score by Chris Vrenna. Now the wait for version 2 is finally over, it appears. The latest update to Emagic Logic features Digidesign HD Accel compatibility on OS X, smart snap option, a fix to hanging MIDI notes and TDM errors, and a demo of Space Designer. The good folks at EM411 have run across a Java applet for mobile phones that lets different users "jam" and create their own tunes with other users on the mobile network. Daisyphone is designed for creating looping music with samples of instruments with modifiable pitches, all represented by a literal daisy with flower petals. The creators were impressed by non-musicians' instant ability to create experimentally. Check out the discussion on EM411 for more interesting issues this raises -- and if you're handy in Java, perhaps create your own "pro" app. I have learned from a contact at Steinberg that the German development team has ported a specific version of Cubase to limited Siemens mobile phones, so music is likely to make more of a splash on your mobile in the near future. Have you found a way to turn your phone into an instrument for sampling, jamming, or collaboration? Hit the comment link and let us know. EM411 Article Post a comment ?